The table below lists the Part Number, Dimensions, and Unit Price for each size of the tool currently available. Review this information carefully before placing your order. To proceed to the Order Form, read and accept the product safety information provided below. This high performance cutting tool, unlike typical cutting tools, may generate sparks when in use. These sparks have the potential to create a fire when this tool is improperly used and for that reason, the manufacturer assumes no liability for it's use. The manufacturer, however, acknowledges that he has followed the guidelines outlined in this website and after hundreds of thousands of parts produced, no fires have occured. The purchaser acknowledges and agrees that it is solely his responsibility for the proper use of the product. The manufacturer provides guidelines which outline only the basic safety precautions. 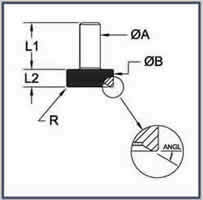 It is the responsibility of the user to fully analyze his particular machining situation and establish guidelines and procedures for the safe operation of this tool.